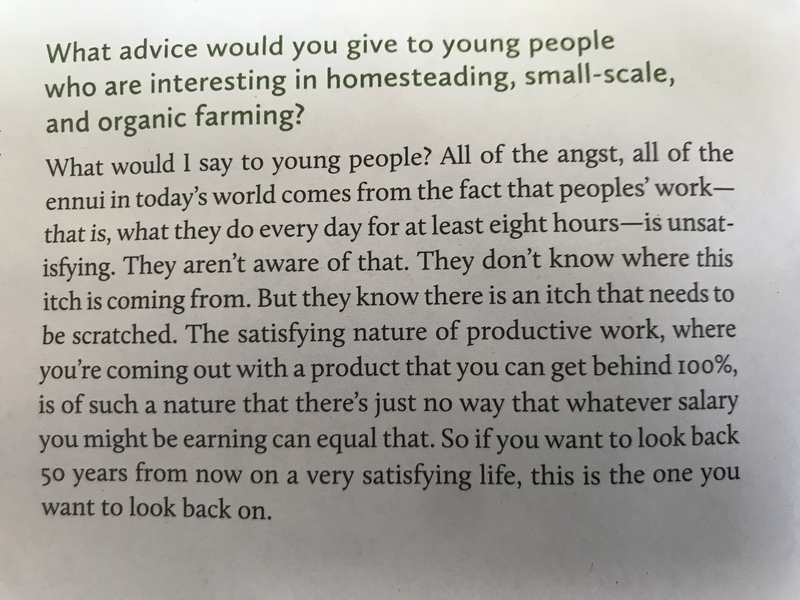 I came across this great interview from farming legend Eliot Coleman, who was asked what he’d say to young folk interested in farming. Young or old, if you think you might have the farming itch (or know someone who does), check out the job description and reach out to paul@potterhillfarm.com. Every once in a while, just the right person comes along to take the farm to another level. 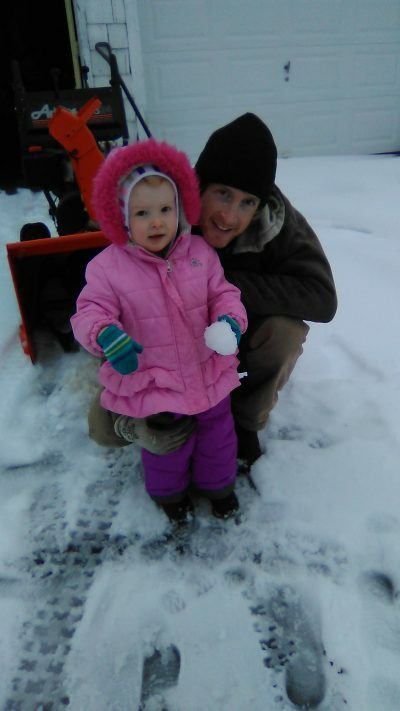 Not long after Jeff started the farm, he joined forces with Sophie and got the farm off the ground. A couple years later, I came along and was eventually handed the reins. And a few years after that, April helped me to not run the farm straight into the mud. And none of us had previous farm experience! With 2 littles under 3 years old, I need to find the next ambitious Sophie/Paul/April to keep the farm on the upswing. Quitting your day job might not be as crazy as you think – I used to work for the Census Bureau after all, and not even that long ago! After spending even just a few months with my hands in the soil, I knew I could never go back to an office. Life is too short to not enjoy what you’re doing for 8+ hours per day. Come grow with us! Meanwhile, back in the tunnel…is it August already? I’m not used to working so hard in the spring! 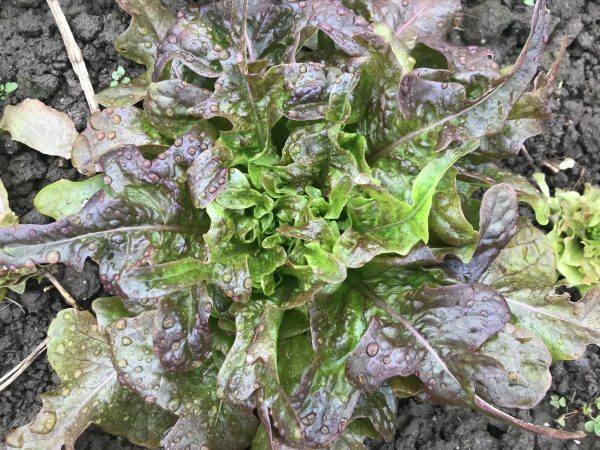 This season extension thing is going to take some getting used to, but it will all be worth it when we’re (hopefully) picking beautiful heads of lettuce and big bunches of kale from the tunnel at the end of April! Before the rain yesterday, I snuck in a quick pass through the garden to see if I couldn’t get the tractor stuck. Pretty sure that’s the first time in the history of Potter Hill farming that a March tractor adventure didn’t end up in lots of mud flinging tire spinning. That was saved for later in the day, after the rain, when the compost delivery guy got stuck. Hope y’all go out and get stuck somewhere in the great outdoors this gorgeous weekend! Wow – our CSA filled up in three days! Your support is truly appreciated. Income at this time of year, and a commitment to a full season of veggies, are so crucial to the planning of the farm season. But don’t panic if you hesitated too long before hitting that submit button. We still have plenty of CSA Card spots available. I’m hoping to fill 10 of those spots today on National CSA Day. Take the plunge and invest in your health and help the farm grow TODAY! How does the CSA Card program differ from our traditional CSA? Glad you asked! With the CSA Card, you get to choose what you want and when you want it. The card can be used at our Monday evening pick-ups (4-7pm) OR Wednesdays at the Grafton Farmers Market (2-6pm), and there is no commitment to coming weekly. Essentially it is a pre-paid card that you use up throughout the season. And you don’t even have to bring the card with you – it’s all automated…you even get email receipts after each purchase! Click here to learn more about the CSA Card, read more quotes from last year’s card members, and to sign-up! Happy Spring everyone! Wait, it’s still February? I keep reminding myself that I’m not way behind, and that we are in fact in the midst of winter. We’ve had a pretty uneventful winter so far up here on the hill. 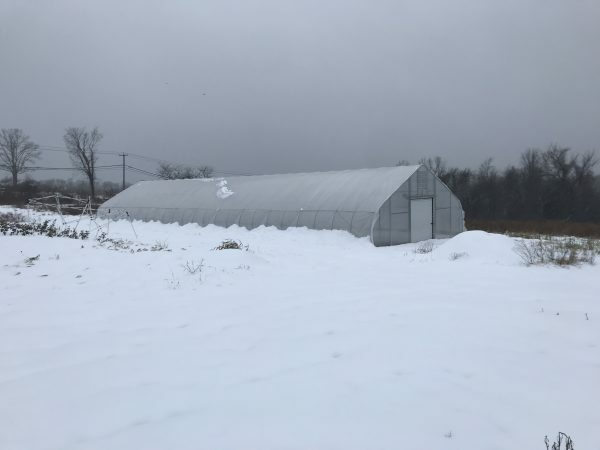 Besides spending lots of time with the girls, I’ve kept busy looking for a business partner to raise animals, experimenting with winter growing (promising results…for next winter), and building a little greenhouse. Although the temps have been mild, it’s hard to get too excited about the slushy snow/rain/ice pellet/sleet or whatever you want to call what’s been falling from the sky lately. But here is something to get excited about – registration is now open for our CSA. 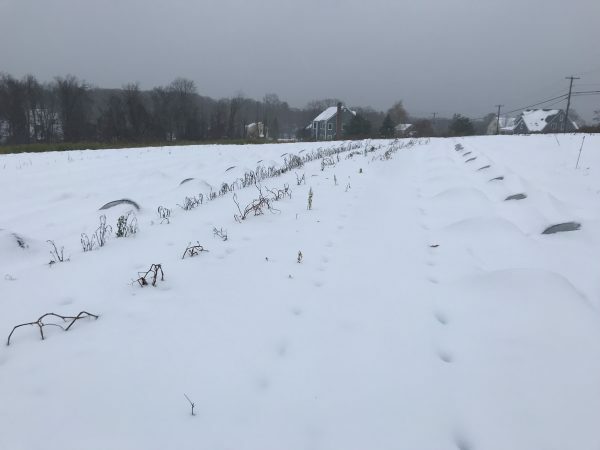 Our Community Supported Agriculture (CSA) was one of the few bright spots of a rough 2018 farming season. Not only did it keep the farm afloat, but the members loved it too! It was such a big hit that it’s already 2/3 full from returning members. Click here to learn more about the CSA and/or to sign-up. Last year, the CSA filled up in less than a week, so delay at your own risk! Thank you for your consideration and support, and please share with anyone you think may be interested! 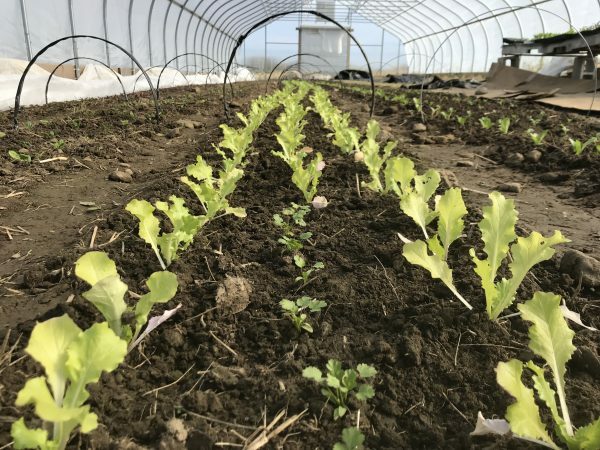 If you are unfamiliar with a CSA, it’s a relatively new and wonderful concept from the farmer’s perspective – the upfront expenses of seeds, supplies, and labor early in the season are steep, while veggies are a labor of love and patience. Without the revenue from pre-selling CSA shares, we don’t start earning anything back until the year is half over. 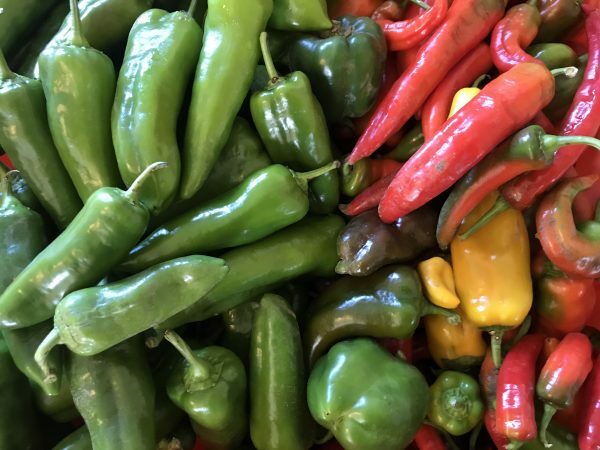 The CSA runs from June-October and pickups are Saturday morning from 10am-1pm (self-serve after 1pm), with 2 “skip weeks” built into the price. Unlike boxed CSAs where everyone gets the same box, you will be able to choose between some items. Two sizes are available – the small is roughly sized to feed two adults, and the large is roughly sized for a family of four. Help Bring Animals Back to the Farm! Happy February! Looks like it’s been two months to the day since I was last in your inbox. Not much has happened up here on the hill other than playing in the high tunnel on sunny days. And scheming. So much scheming. Mostly about how to bring animals back to the farm. I’ve come to the hard decision that with two littles under 3 years old, I can’t run both the animal and vegetable operations anymore. So the scheme I came up with is to clone myself and then I can be in two places at once. My backup plan is to find a business partner that wants to raise animals on this gorgeous farm! Know someone who might be interested? Please forward this to them! To facilitate forwarding, below is a little summary of generally what I’m looking for. Thanks in advance for your help spreading the word! Hi! 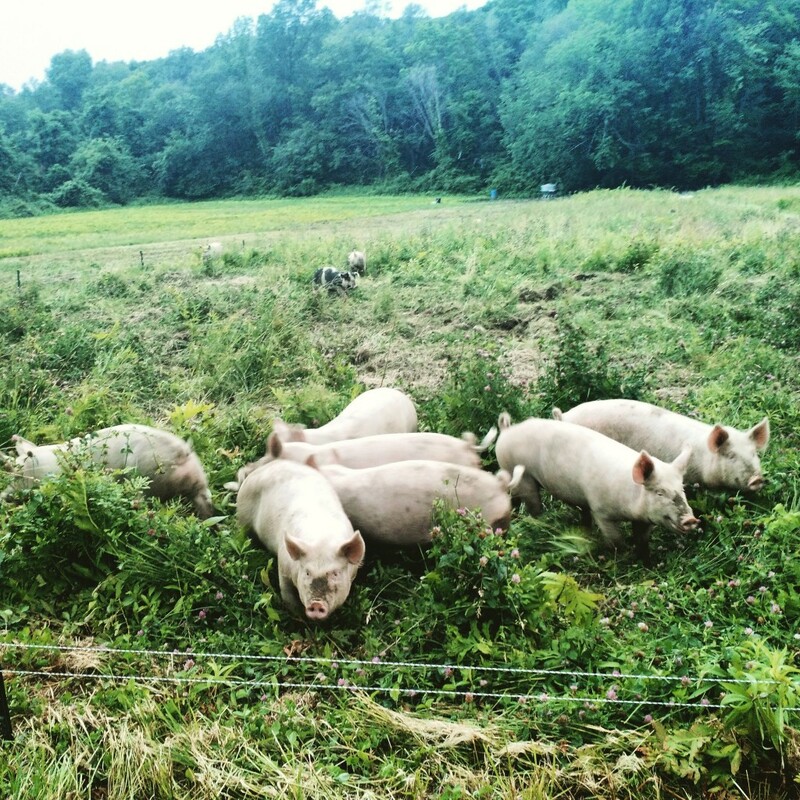 I’m Paul and I run Potter Hill Farm in Grafton, MA. 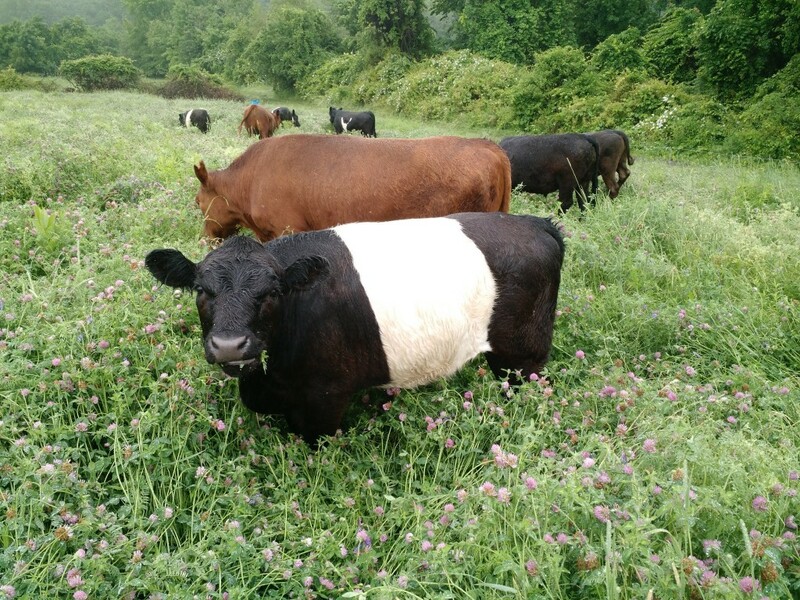 We have historically grazed animals on the roughly 45 acres of pasture, but I currently only use an acre or so for certified organic vegetables. The farm is owned by the Grafton Land Trust with a very favorable 5 year lease. At the end of a mile-long dead end hill, with views of Worcester and Mt Wachusett, the farm is a special place to work (see pictures). 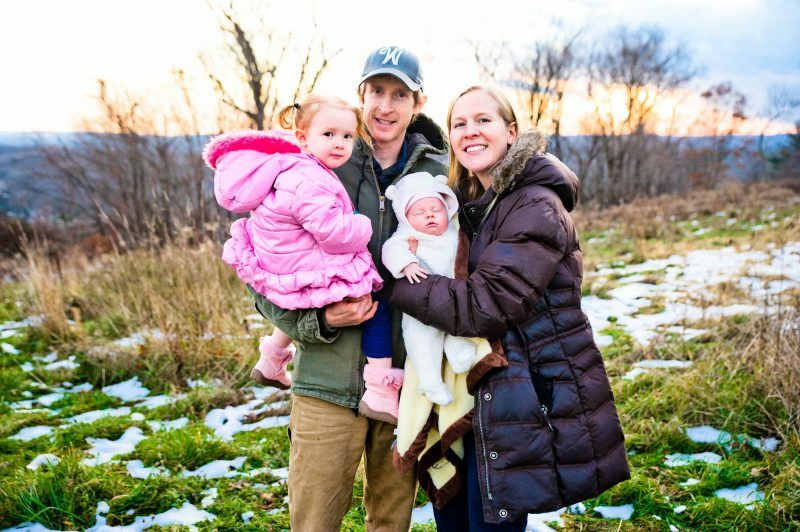 I stopped raising beef and pork after our first child was born. Since our second was born this fall, I’ve ruled out getting back into meat in the foreseeable future as my wife works full-time off the farm. I did have 80 layers this season, but I am happy to pass the torch on eggs too if desired. I would ideally like to find a motivated partner who creates their own value via raising animals here, but would also consider hiring a livestock manager as an employee. Either way, livestock experience is necessary for this position. I have a water line laid out to each field, and plenty of electric fencing and chargers. We do have an open barn that has been used to overwinter 6 beef animals and layers, but feeder beef, pigs, or chickens that don’t need to overwinter are a better fit without improvements to the barn. This would be a great opportunity to strike out on your own for someone who has been managing livestock for a couple years. There is a strong unmet demand for local meat and eggs in our area, especially among my dedicated customers and at the Grafton Farmers Market, which doesn’t have a meat vendor. On-farm housing is not currently available but there’s a possibility of it in the future. Please reply to paul@potterhillfarm.com with any questions or if you would like to see the farm. Oh, and go Pats…I guess. As they say in sports, records are made to be broken. I really hope the one we set this season isn’t though…at least not while I’m still farming. The Boston Globe confirmed what I’ve been telling anyone who’d listen – that this rain was unprecedented. In fact, in records dating back to 1890 (gotta love New England), this was the wettest fall on record. And that was before the 1.5″ of rain last week, and with 20 days left of fall, technically. Here’s another good article this rain obsessed farmer somehow missed at the start of November. Highlights: from 9/1 to 11/6, it rained on 30 days v 8 days with clear skies. And since 9/1, we had 2 stretches (in 3 months!) where it did not rain for 3 straight days. Ironically, seeing it in writing has buoyed me somewhat. 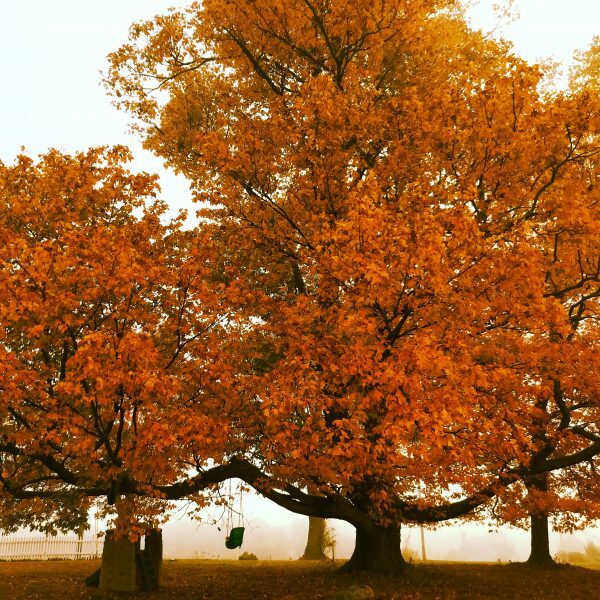 I’ve lived in New England for only 9 years now, but my gut said this fall was NOT normal. I can now go confidently into next season knowing this will not happen again, at least not for a while. Even with the erratic weather we are facing thanks to climate change, the odds of a repeat of this season are minuscule. 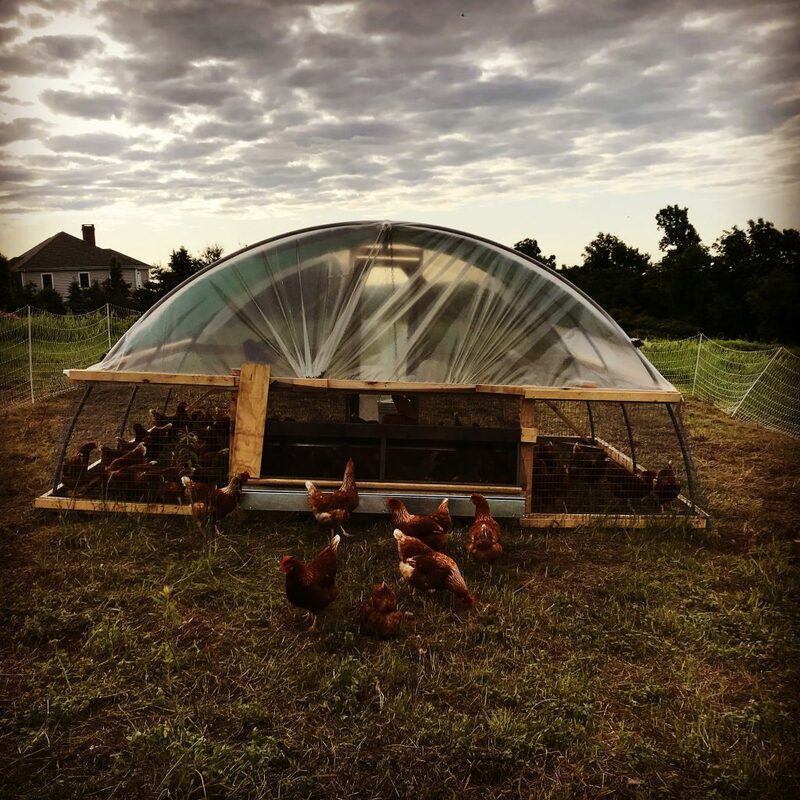 Which is good because this season sure had me thinking about the future and the sustainability of Potter Hill Farm and small scale farming in general. Potter Hill is magical on a nice day, especially in the fall. But farming up here is not for the uninspired. I felt like I was fighting nature this whole season instead of working with it. Farming a north facing slope with clay just under the topsoil is challenging (wet) enough in a dry year. Try farming with three times the normal precipitation! And the reward? It needs to be more than the intangibles of working the land at some point. This was supposed to be the year the farm finally made some money for our family. 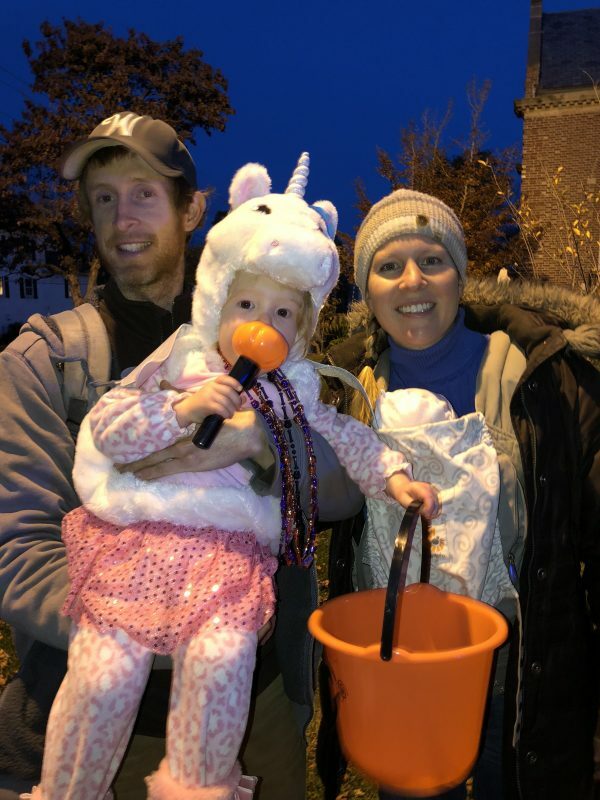 I has some serious temptations to be a stay at home dad after the season ended – I would make about the same and work about 90 hours less per week, depending on your definition of work! But I’m about as stubborn as they come, which is probably a necessity to be a farmer. So you’re stuck reading my rants for at least another season. I have a feeling it’s going to be a great year! If you read this far, your reward is that we have just enough left to justify another pickup. If you can believe it, lettuce (double covered) and a few other greens survived 8 degrees. Plus we have some roots left, and a number of salsas and sirachas as well, which make an easy and delicious gift at a holiday party. Everything is limited on the website. And sorry, no eggs! I sold the last of the ladies the day before Thanksgiving. 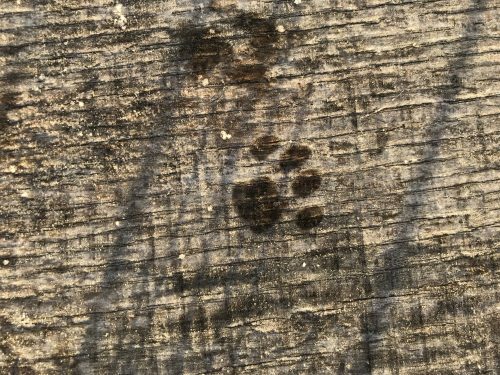 We have some beautiful fall colors around the farm, but you’re not going to find them outside anymore – peak peeper season lasted all of maybe one afternoon up on the hill. One tree up here in particular is typically magical this time of year – a mighty maple that’s probably as old as our 248 year old farm house. Or perhaps it’s the offspring of the trees felled to construct this house in 1770. Either way, one of the many monsoons paired with one of the many wind storms we’ve had this past month took down all the leaves overnight…before I even had a chance to take a picture of it in all its glory (picture above from last year). Instead you can find a little bit of fall when you cut open our roots. 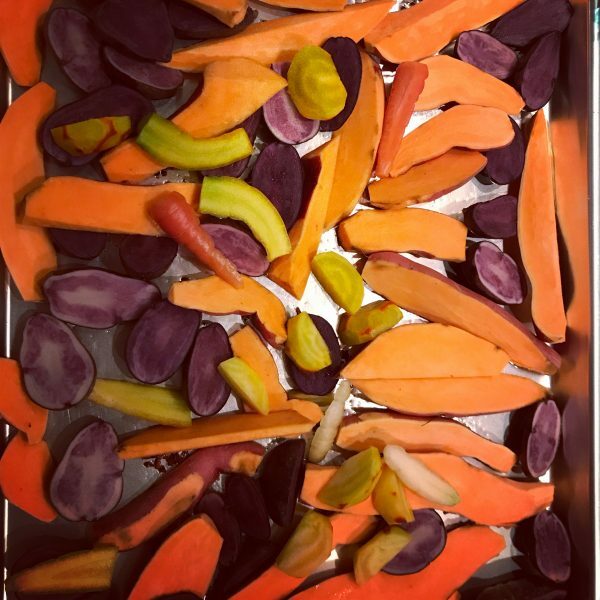 Sweet potatoes, potatoes, carrots, and beets team up to delight your eyes and palate. And don’t forget the celeriac – the ugliest, best vegetable you’ve never tried. Unfortunately pretty much everything is limited at this point, other than potatoes and onions – the only things out of the ground before the faucet was turned (and left) on! But it’s hard to beat fresh things in mid-November. I almost got through a whole newsletter without giving you a weather report. But how can I not complain when there’s another storm beating down our beleaguered veggies? At least the wind isn’t howling….I guess (Jenni says I need to be more optimistic or y’all will think I’m continually depressed). Why does it seem like we’re always having an epic storm when I write this newsletter? Oh right, because we have multiple epic storms per week so the odds are good. It was like a fellow Grafton Market vendor lamenting the rain just about every Wednesday – other vendors who did multiple markets piped in that our market wasn’t the only one this season constantly under the threat of rain. Oh well, guess it’s just one of those seasons. You know, the type of season when it rains every flipping day from July-November. If any weather junkies out there can point me to a good resource or article on rainfall amounts v average for our area, I’d love to see it! Thanks for making it this far. Yes, Monday is a holiday and yes we’ll still have the pickup, but I’m going to shave an hour off – so it’s 4-6pm on Monday. As always, if you can’t make it by 6, I can pack up your order…just let me know. It’s going to get pretty cold this weekend – as long as it doesn’t get toooo cooooold, I’m pretty confident we’ll have what is available on the website, and then some. We spent today tucking in all the stuff worth covering. The hardy stock still out there should handle 25 degrees but no guarantees if it drops much below that. Sorry folks, with yet another monsoon currently inundating our fields (I can literally hear cats and dogs falling outside), I’m going to try again with a week off so no pickup this week. 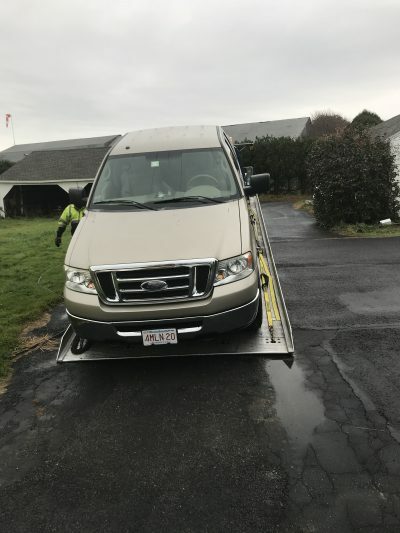 After my last email begging for a day off, I woke up to headless chicken bodies scattered everywhere and a truck that wouldn’t start and in need of towing. Not much of a day off! Maybe I’m just destined to never have a day off…we’ll see come Monday. Pictures are going to do all the talking this week because Jenni and I are running on very little sleep right now. In fact, I made Pat order me around while moving chickens the other day because my brain stopped computing. Paddy Rose was up a million times a few nights ago, and when she finally stopped waking up, Nora started carrying on. They’re conspiring against us already!! 1: My baby being towed away (don’t worry it’s back now). 2. 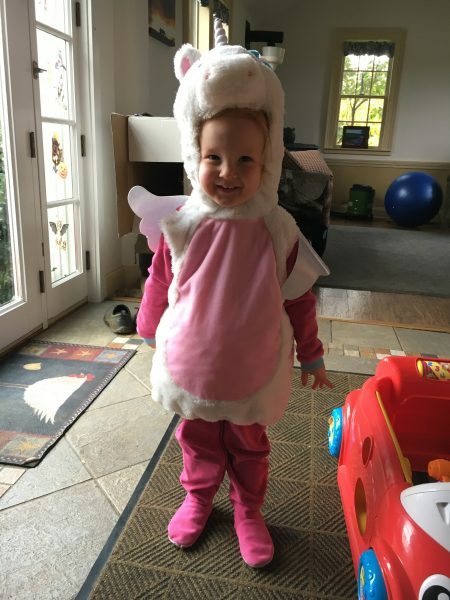 Something got into the chicken pen Sunday morning and it wasn’t the sweet unicorn (3) in the next picture. 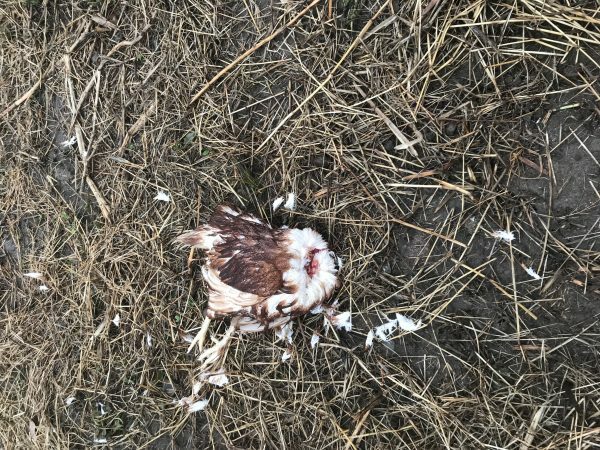 Sorry for the graphic picture, but farming is rough sometimes. I only found 6 bodies, so it could have been (or maybe was) worse. If this inspires you to keep chickens, please let me know as I am selling the survivors. I do this every year – we don’t have a very hospitable location for chickens up on the hill in the winter. 4. We planted the last of the high tunnel seedlings and tightened up some gaps on Thursday. It’s probably too late to get much out of it, but as another farmer told me, at least now I’ll know when too late is. 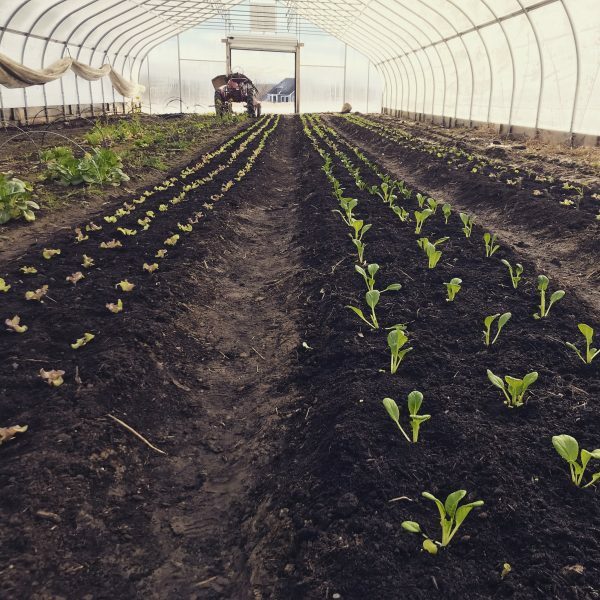 In case you’re wondering, in the tunnel we planted lettuce, spinach, kale, bok choi, salad turnips, mustard greens, swiss chard, tokyo bekana, tatsoi, cilantro, and vitamin green. Ambitious, optimistic…and likely foolish! 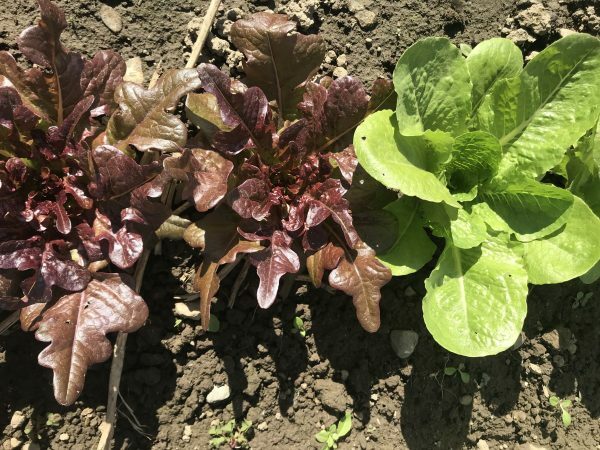 5 and 6: Some greens like parsley and lettuce are still going strong despite everything. I JUST realized maybe nature is telling us not so subtlety what we should be eating…but only if you stop and think about it. Parsley especially. I’ve been continually more impressed by how the parsley is doing as it thrives while everything around it dies. But I didn’t have one bunch of it last month! Must be the sleep deprivation. How much more obvious can it get? Want to be disease free, pest free, and practically indestructible? Eat mor chikin parsly…you are what you eat right? 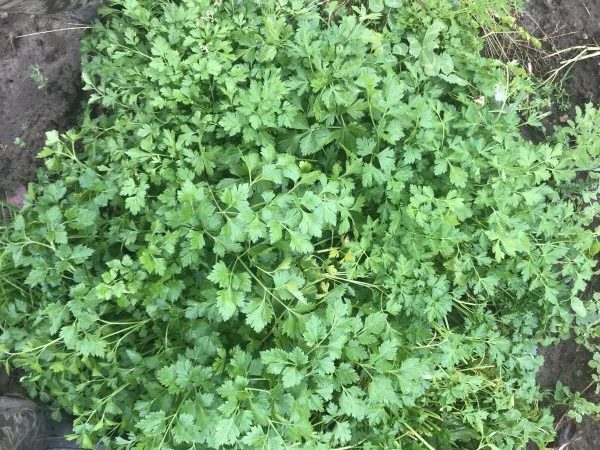 It’s going to be one of my missions next year to inspire a parsley craze. Just in time for Halloween, a gusty nor’easter monsoon timed with frozen ground from a super cold night. At least it wasn’t snow? I dunno, it might have been better for the veggies. In the grand scheme of this year, we really didn’t get a massive amount of rain. It made me wonder why the garden was in such rough shape (underwater) in my brief excursion outside to collect eggs…until I realized the ground must still be partially frozen and there’s no where for the water to go. Either that or the ground is still just fully saturated. It will be interesting to see what survives – sorry, I’m not putting on my waders for a harvest on Monday so there will be no pickup tomorrow! Plus I need a reprieve! It’s amazing, I can go non-stop all season long and then we hit a week of no sleep and suddenly it’s exhausting just to type this newsletter. I guess it doesn’t help that it’s approaching midnight after a LONG day. 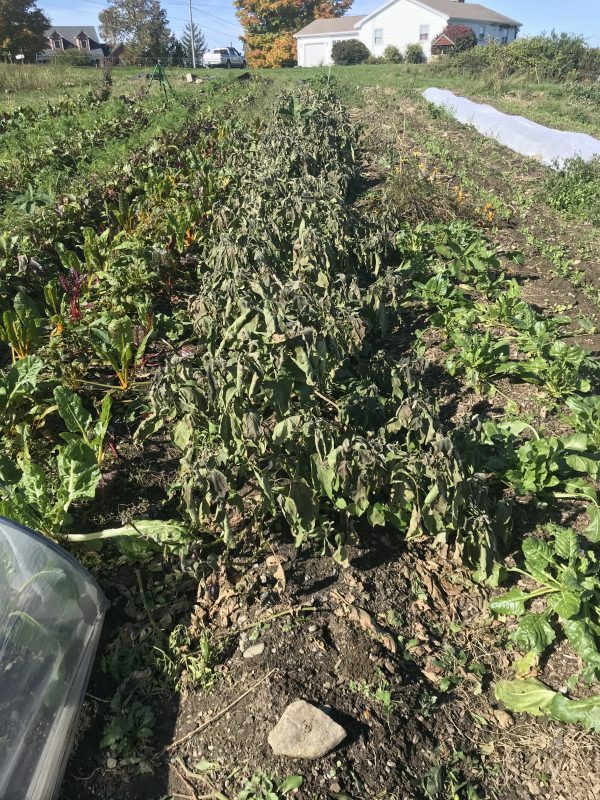 I will keep you posted on next Monday – fingers crossed the weather actually looks pretty decent so we could have a good spread if the veggies survived the onslaught. The lettuce especially has been looking great! Things are getting spicy up here on the hill. We harvested a boatload of hot peppers ahead of the frost. Hot sauce is in your future! If you don’t have time to make it yourself, I bought a bunch of organic, naturally fermented salsa and siracha sauce from an innovative and rockstar farm in Sunderland, MA. Yes, ORGANIC FERMENTED SIRACHA! I brought some in last year and it was a big hit – I ran out of my personal stash a couple months ago and have been dying for this season’s batch to come out. Scroll to the bottom of the ordering page to find them. The cold wind kept me inside Thursday, so I didn’t assess the damage from the cold night(s) till Friday. I’m not sure which night was the silent killer but it took out all of the tomatoes and eggplant, which honestly were circling the drain anyway. We spent all day Wednesday picking ahead of the cold – in hindsight, there was some precious last tidbits of summer that I could have saved. Coulda woulda shoulda. There was a surprising amount of peppers (mostly green, lots of hots) and eggplant left out there. If any of you are lucky enough to get the limited eggplant on Monday, here’s our go-to eggplant recipe worth it’s weight in gold, courtesy of a wise farmer up north…from back in 2013 when Potter Hill Farm was about as old as baby Nora. 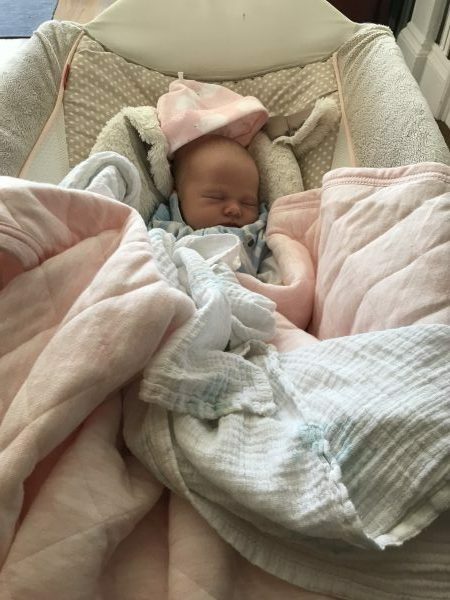 Speaking of who, I was on Nora duty while writing this – my first time alone with her and she snoozed the whole time. She’s definitely a different baby from Paddy Rose so far, though it has only been a week. 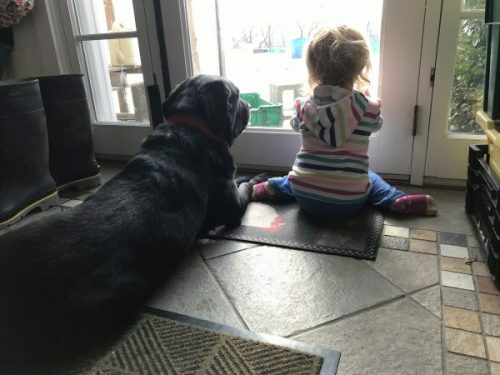 A seemingly very long week – she’s so seamlessly integrated into the family that I feel she’s been with us much longer! 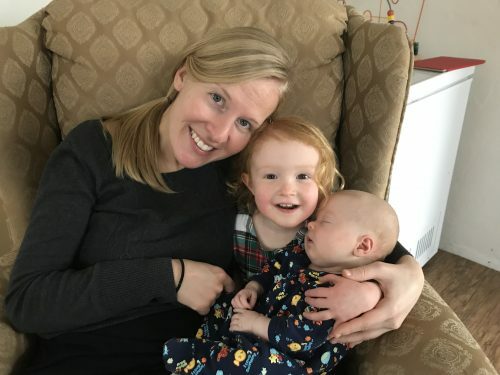 Paddy Rose has had lots of emotions but in true big sister fashion, she has directed nothing but love and kisses toward Nora and plenty of stubbornness and terror at her parents. Just kidding. Sort of. Lots of great greens going strong still, especially in the lettuce department. A couple new items too, but you’ll have to check the list to find out what!